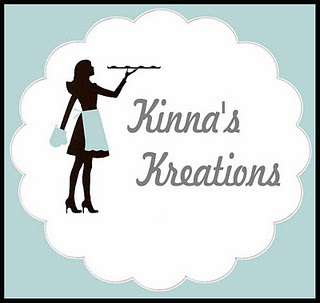 We are lucky to have McKinna from Kinna’s Kreations share one of her super fun treats with us today! McKinna is one of my childhood friends and super talented! Hey OTBM Readers! 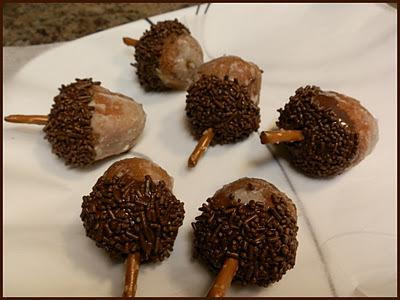 I’m excited to be here and share this super easy, kid friendly and cute treat with you guys! I have been decorating cakes, cupcakes and cake pops for over a year now! It is something I have always wanted to do, so I took the Wilton 1, 11 and Fondant classes and am now finally achieving it! I hope you and your little ones enjoy this treat! Directions: Melt the Nutella until smooth – approx 20-25 seconds. 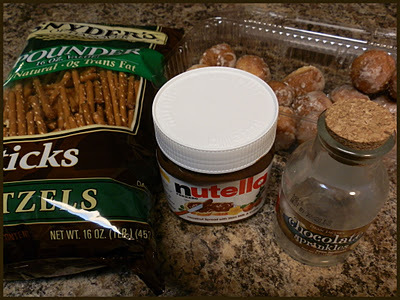 Dip just less the 1/2 the donut hole in the Nutella and then lightly dip or roll the Nutella covered part of the donut hole in the chocolate sprinkles. Top with a Pretzel for the stem! Thanks so much to McKinna for sharing this fun and easy treat! I hope that you’ll be back soon to share a fun Christmas treat with us too! >Thanks for sharing @ Link n' Learn! So cute and creative! >I am pinning these- so creative! Visiting from Creative Genius Party. >So so cute–thanks for the instructions! >We did something similar and they're so tasty! Could you please link these on our Fun Stuff Friday's linky party! >These look super cute! I would love for you to link this post to my Thanksgiving link up! >These are adorable! As if doughnuts aren't good enough on their own, the nutella must be amazing on them!